Are you ready for another Eggciting Easter?! Welcome to the annual Super Cable Car Easter Egg Hunt of 2019! Pick up your Easter Quiz from the Lambton Quay Ticket Office and enjoy an eggciting journey with us on the Cable Car while working out your answers. Cluck... cluck... Cluck... Watch for Clucky the Hen at the Cable Car Museum too! On each day, the first 50 Easter Egg Hunters to return their completed quiz to our staff at Lambton Quay will receive an Easter Treat! 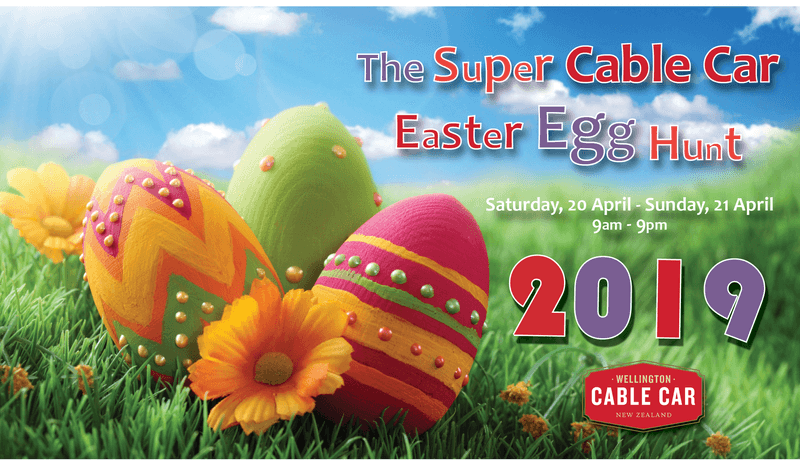 All entries will automatically go in the draw to win a prize pack (Cable Car & Easter goodies)! The winner will be announced on Wednesday, 24th April 2019. Don't forget to dress up in your favourite Easter costume and share your Easter pictures with us on Facebook or Instagram with #WellingtonCableCar. Best dressed will also win a prize! The Super Cable Car Easter Egg Hunt is suitable for children at any age.